A bill dictating how a woman consults with her doctor when seeking an abortion passed in the Wisconsin Assembly yesterday. 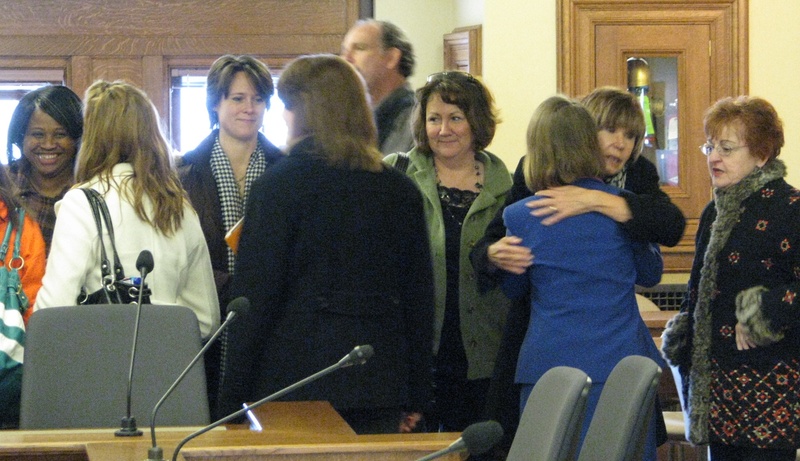 Senator Mary Lazich (in blue suit) hugs Susan Armacost of Wisconsin Right to Life at the conclusion of the public hearing on SB 306 in December. The bill is backed by Wisconsin Catholic Conference, Pro-Life Wisconsin, Wisconsin Family Action and Wisconsin Right to Life. These same groups also promoted and lobbied for SB 92 which allows insurance companies to deny coverage for abortions, and SB 237, the repeal of the Healthy Youth Act. SB 306 requires that only a physician can inform a woman of her right to refuse or consent to an abortion, and it prohibits a woman from having a partner, family member or friend at her side when she meets with her doctor to request an abortion. A physician could be charged with a Class I felony for failing to comply with the new law. The bill also prevents physicians from consulting with patients via webcam when prescribing abortion-inducing drugs, something that is currently done in neighboring states to meet the needs of women living in rural areas. According to the bill, a woman who has an abortion will be required to return to the same facility for a follow-up visit, rather than being allowed to receive the care from her primary physician. 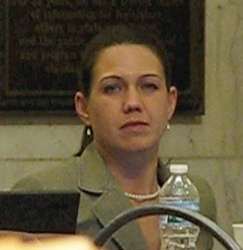 Lisa Subek, Executive Director of NARAL Pro-Choice, testified in opposition to SB 306 at the December 13 hearing. She stated that it “imposes new and unnecessary barriers for women seeking safe and legal abortion care and is yet another example of politicians interfering with decisions that should be made privately between a woman and her doctor. Ironically, early Wednesday morning, the Assembly passed SB 237 — the repeal of the Healthy Youth Act. Seen as more evidence of the War on Women, SB 237 is described as, “a bill that restricts teenagers’ access to medically accurate information about human sexuality. The bill will destroy what some characterize as the “gold standard” for human sexuality education in public schools by eliminating all references to contraception, and requires schools to teach that abstinence is the only reliable way to prevent pregnancy and sexually transmitted diseases. Rep. Janet Bewley rails against republicans for law that invades delivery of medical care. During the floor debate, Rep. Kelda Roys prososes a ‘rectal exams for men’ amendment to “coerced” abortion bill. If you have a wife, daughter, or sister and you walk on two legs, standing upright, without your knuckles scraping the ground, you should be both angry and afraid of this law. Who are these people? Congratulations for racing back to the 20th Century. Telemedicine is the gold standard for delivering care to rural areas in which access is limited. You will regret these ridiculous attempts at raising obstacles to a legal, safe and POPULAR medical procedure, when you try for re-election. And on a personal note to female co-sponsors: Shame on you. These elected officials all look overweight to me. They probably eat at chain restaurants and are pre-diabetic. I don’t believe my tax dollars should pay for their medical issues – I don’t believe in processed food that gets subsidized by the government. Yet, here I am paying for things I do not believe in. Make medical insurance coverage based on the health of the patient & see how they like it. This sickens me. Why is it okay for these elected people to force their religious beliefs on everyone? Why is it okay to separate a woman from her support system when it comes time to make what is an awful decision to make? These elected morons are a bunch of asshats.